BIRTH OF AN IDEA: Jennifer Pierotti founded fussbudget.com to fill a niche she recognized when her own daughter attended summer camp. When Jennifer Pierotti sent her 10-year-old daughter off to camp one summer, she added something extra among the usual items like clothes, toothbrush and a flashlight. And that summer, her daughter didn't have to worry about boredom or homesickness at camp. Pierotti's extra item was a care package filled with everything from toys to plush animals to games. Admittedly, she got carried away creating it - but she liked the idea of sending care packages to campers so much that Pierotti, a registered commodities broker, decided to build a small business around it. Wide open market. That's how she began fussbudget.com, a home-based Internet retail outlet that has grown so fast, it got some major exposure in a recent article by MSNBC.com. And it didn't take long for Pierotti, a mother of three, to learn she'd found a wide open market. According to the American Camping Association, more than 10 million children and adults attend camp each year. "My maiden name is Fuss, and originally, I was going to start a little clothing company," Pierotti said. "The slogan was going to be 'Shopping without a fuss in my budget,' but that never came to be." So with a small change in the product line inspired by her daughter's trip to camp, Pierotti laid the groundwork for what has become a thriving small business. The new venture's slogan became "Care packages with all of the fun and none of the fuss." Parental appeal. The idea has worked, she said, because there are many parents out there like her. "When my oldest daughter went to camp in North Carolina and I made the care package for her, I kind of went a little crazy," Pierotti laughed. "But I thought, 'If I went this crazy, other moms would, too.' And they do. This is just our second year, and we've already doubled our sales from last year, so it's really been great. "For people who just don't have the time to go and look for these things, it's a one-stop shop. We've got every kind of gift you need, from markers to rubber chickens. We ship all the toys; there's no cost for shipping anywhere in the U.S. or Canada. And a lot of the toys put in the care packages are the same toys you'd find in a high-end toy store." They include kid-friendly contraptions such as paddle balls, playing cards and Mad Libs. Pierotti builds each care package in her "warehouse," which is overflowing with toys and doubles as the garage of her East Memphis home. Use of feedback. Her customers include Memphian Kelly Burrow, a mother of two who said she's impressed by Pierotti's product line and attention to detail. "I've used her for the last two summers to send packages to my children at camp," Burrow said. "They've loved them, and it's been fun stuff they can play with at the cabin or share with their friends and have a good time. "Last summer I did a package with her, and on my feedback I told her my girls are really into horses, and I wish she would carry some horse items. Well, this summer she just had all kinds of horse items to pick from. So I really thought, 'I like somebody who takes your suggestions and goes with it.'" Pierotti has a simple formula for her operation. Her customers fill out a form at her Web site, www.fussbudget.com, which includes space for the camper's age, gender and interests. It forms the basis for each care package Pierotti puts together. Pampered campers. The packs come in small, medium and large standard versions, as well as customized arrangements like the "Pampered Camper" and "Junior Pampered Camper" packages. Standard-size packages range in price from $35 to $100, and Pierotti only recently introduced theme packages such as the "Pampered Camper," which includes items specifically for girls. A characteristic of the business Pierotti has not been able to explain is that most of her sales so far have been to Northerners. 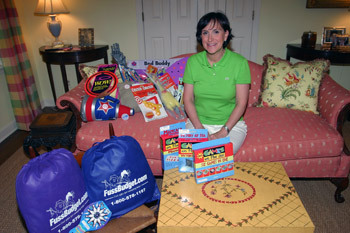 Lately, she has also seen orders for packages for children in hospitals. Sales also come from - no surprise - the camps themselves, many of which have included Pierotti's brochures in literature sent to campers. "I had also thought we would be targeting much younger kids, but we're actually selling to campers anywhere from age 7 to 19," she said. "And I thought we'd do business mostly for younger girls, but that's not the case either." New ideas. To make fussbudget.com more of a year-round business, Pierotti is rolling out two new care packages this fall: one for boarding school students and another for college kids. She uses an assortment of "judges" who serve as a sounding board for new ideas - her three daughters, plus several nieces who offer advice. Pierotti, who has no previous entrepreneurial experience, said she has one major goal for fussbudget.com. "I'd like it to be huge," she said. "Last year, we were very pleasantly surprised when MSNBC did the article on us. And they did it on us and another company, which is the biggest in the business."